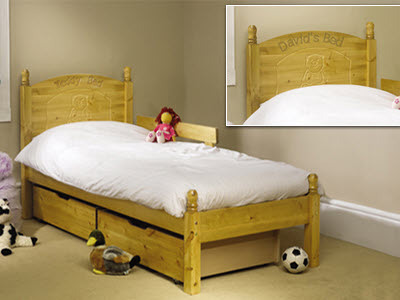 The child’s name can be engraved in place of the words ‘Teddy Bed’. As the child grows older, they may not want the teddy/football and engraving to show. In this instance, the head end of the bed can be turned to show a fully finished, but plain headboard. Our Teddy & Football Beds are available 2’6” or 3’ wide, designed to fit a 5’9” mattress, so allowing it to fit into a smaller bedroom. It comes complete with a single guard rail which can be fitted to either side of the bed. Additional guard rail available on request. • Supplied in antique finish or unfinished ready to stain or varnish or natural lacquer.